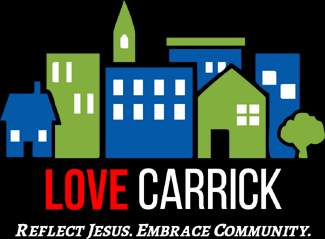 Love Carrick is an urban, multi-ethnic, non-denominational church living in community, joining Jesus in bringing His love, liberty, and hope to every pocket of our neighborhood. We live in close proximity to each other and are joining Jesus in His beautiful mission to love this place. Being involved in Carrick community groups, the local schools, the library, and shopping at local businesses is extremely important to us. We are an affiliate ministry of One Collective who aims to bring individuals, schools, community organizations and ministries together to see Carrick transformed by the power of God. We are a community of believers seeking to grow in relationship with God and one another, and to reach out to the world around us with the Good News that God himself has come to rescue and renew all of creation through the life, death and resurrection of Jesus, and the empowerment of the Holy Spirit. Our goal is to live as citizens of God’s Kingdom, which we believe to be a current and future reality, and to work, play, and serve in our communities in a way that demonstrates and shares the love and ministry of Jesus. Redemption seeks to be an incarnational community, bringing the aroma of Christ to a historic, post-industrial town on the fringe of Philadelphia. Redemption is a community of sinners and skeptics longing for the Redemption of God; a community called to be the hands and feet of Jesus in Bristol, Bucks County, Philadelphia and the world.